@Telok Blangah | Get Your Grub On! Fish balls are still weird. 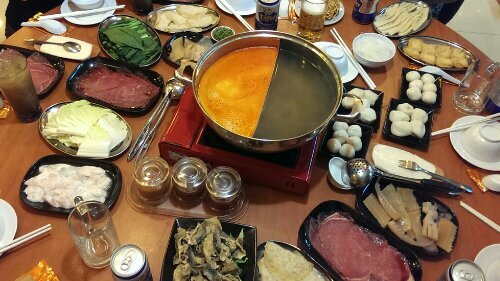 Friends came back to town for a visit after moving to the U.S. last year and to give them a proper welcome we all met at ‘San Laksa Steamboat’ down on Telok Blangah Road. I hadn’t been here before and therefore came with my old steamboat and laksa prejudices in tow. As usual the order placing went a bit crazy and our table quickly filled up with heaps of little plates with some more and some less exciting dishes. Actually the whole thing was surprisingly delicious, the laksa broth gave it a kicker which was much more appealing then an ordinary and rather boring soup would have been and it wasn’t too heavy or creamy either and also hardly thickened up during the cooking and dipping. In terms of little dishes some of my favourites were the thin lean ‘Beef Striploin‘ (牛肉) slices, that were a big surprise and the ‘Beancurd Skin‘ (豆腐皮) which was perfectly soaking up that coconutty broth. I was also a big fan of all the greens and mushrooms we threw in and even the ‘Fish Balls‘ (鱼丸) weren’t totally horrible, the ‘Fuzhou Fish Balls‘ (福州鱼丸) in fact, the ones filled with pork mince, were actually quite tasty and nearly converted me tolerating them from now on. What honestly was super good though was the ‘Fried Fish Skin‘ which we must have re-ordered around three to four times cause everybody loved it and it disappeared as soon as the waiter let go of the plate. Crispy goodness. San’s is a simple place in a pretty inconvenient location and with hardly any parking in front but if you want to get a nice twist on your usual steamboat experience you should make your way down here anyway. Enjoy. After my ‘Ramen Burger‘ and just four meters across the room I ordered my second course the ‘Dipping-style La Mien with Laksa Cream‘ or much shorter ‘Laksa Tsukemen’ from the other pop-up concept shop here, ‘Rakusabā’. We were a bit back in line and particular attention was paid to the creation of each plate so we had to wait quite sometime until we finally got ours. For me the hold off wasn’t too bad as I had the burger just before but my friend nearly starved watching us eating as it was already quite late for lunch. When the time had come it all looked pretty neat and interesting and I shot my pictures as fast as I could to finally start eating. The noodles weren’t too special, no typical and slippery laksa bee hoon anyway and so that they wouldn’t stick together they were drizzled with some oil. Unfortunately they were still a little stuck so ended up just being oily sticky noodles. Dipping them into the thick concentrated laksa cream was quite funny and unfamiliar. Flavours as one remembers laksa, coconutty and spicy with an unusual viscous consistency. It was good we were so hungry though as every slurp was extremely filling, tasty and interesting definitely but just a tad too rich for my liking. What I enjoyed most about this dish were all the condiments on the plate. There was a stick of crispy oven roasted you tiao that was quite hard to bite, some wonderfully crunchy lotus roots, two decadent pieces of soft and juicy pork belly confit, not so soft soft egg with spicy shrimp sambal and my absolute favourite, the salmon otak otak gratin (fishcake) with it’s hint of spicyness, light taste and some crunchy pickled cucumbers on top. When finished with all, we received a top up of a shrimp and pork infused broth to water down the laksa cream for the last slurps. Not bad at all and how it’s properly done tsukemen-style, but I was just too full by then to completely empty my bowl. I really kinda liked it because of it’s originality and the many very different things I got to try. Just the waiting time a couple of minutes shorter and the sauce a couple drops more watery would have made it even more enjoyable. 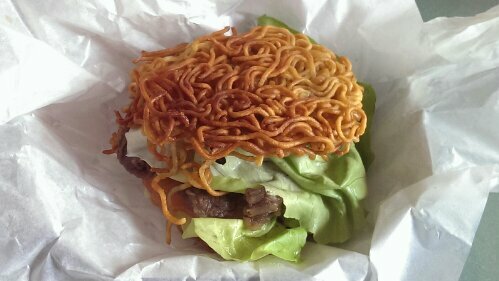 It’s ramen, it’s a burger, it’s awesome. Time was slowly running out until some of the pop-up eateries at Gillman Barracks were about to disappear and so I finally made the effort on this hot Saturday and came down here to try them out. My first order was the ‘Bulgogi Ramen Burger‘ from ‘The Traveling C.O.W.’ which also has a food truck going around the city. I wasn’t too hopeful that this was going too be much of a taste surprise but more of a gimmick kinda way of playing and switching the ingredients around. I was quickly taught differently when I took my first crunchy bite out of this. The panfried noodle paddies, even though super crispy and crackling away, were nice and chewy on the inside and held up pretty well throughout me going to town on it. The fresh lettuce and tomatoes added some more rather fresh crunchy textures and the bulgogi beef just tasted crazy good – juicy, sweetish savoury like it is supposed to be. I just hoped there would have been more of it. Only the sesame dressing they used I couldn’t really pick out in between this flavour bonanza but overall this was great stuff and less messy to eat than expected. Nice job. I wasn’t too sure if it even makes sense to write about something that’s about to close down but I read somewhere that they are planning to take this on to their truck menu and really wish that’s true, hopefully even with a normal burger patty version in tow. Update: In the meantime they also broiled up some mean ‘Wagyu Burgers‘ at Laneway 2014. After my lunch I went outside into the sun to warm up a bit and there it was, the ‘Magnum Pleasure Store’. Dessert decision made. 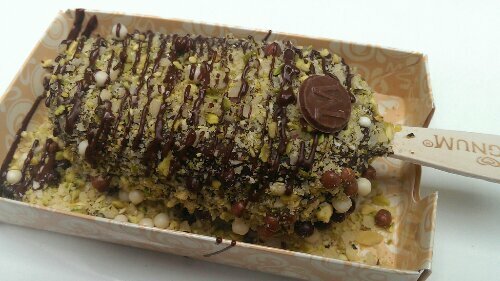 I chose the dark chocolate dip and let them sprinkle it with some chocolate pearls and pop rocks. Latter were a great idea as they made it so much more fun to eat, creamy vanilla ice cream, dark and slightly bitter chocolate infused with these prickly buggers, bubbly and tingling away. It was so hot though that the ice cream melted faster than I could keep up with which resulting in me making such a mess eating it, that one of the considerate waiters came out to bring me some extra napkins. Thanks so much. I haven’t been to VivoCity in over a year and was surprised how much it had actually changed and how many new shops and restaurants had opened up. One of them was ‘Le Nu’ a ‘Taiwanese Beef Noodle‘ shop that was so new the congratulation flowers were still standing around. I was just about to leave for another trip to Taipei and wasn’t sure if it was such a good idea but since I obviously don’t come by here very regularly and it looked kinda tempting I sat down and hoped for the best. I ordered the standard bowl with braised brisket with the flat broader noodles and to my joy they also had these little side dishes which you always get in Taiwan so I had two of those as well. The cucumbers were great but the chilled beans with garlic were fantastic, squeaky and delicious. 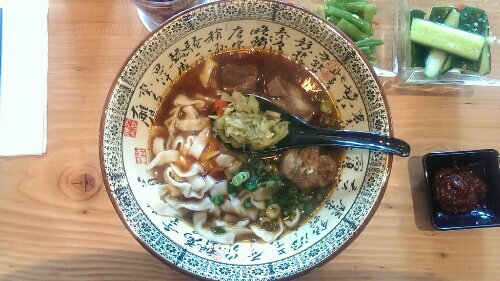 Then came my bowl and yet another positive note, the noodles they used were as fat as those at ‘18 Café‘, wonderful chewy and tasted awesome. The broth was rich of beefy flavours and I appreciated the spoon of preserved greens that added a certain bitterness. The catch was the beef, that taste wise was alright but unfortunately came out stringy and dry which also the freshly made signature bean dip couldn’t really help much with. It wasn’t perfect, mainly because of the beef chunks but these were hands down the best ‘Taiwanese Beef Noodles’ that I have had in Singapore so far and I wouldn’t mind having those again, maybe trying the more expensive wagyu version next time. Best of success and stick around. After an already long night we decided to head over to St. James for some more drinks but when we arrived we changed our mind and decided to have some good old supper instead. 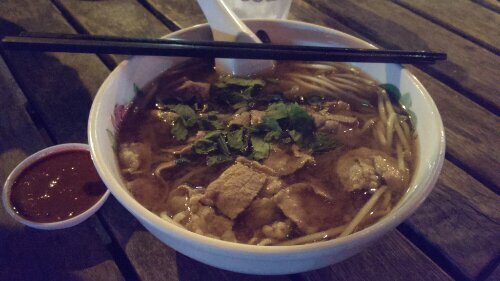 Most of the stalls at the Food Republic Beer Garden had already closed but we passed ‘Odeon Beef Noodle’ and it was settled. The ‘Beef Noodles‘ had slight resemblance to ‘Vietnamese Pho‘, sweet with a touch of sour, nicely beefy and with some cilantro and thai basil like greens that gave it a fresh herbal flavor. The beef was thinly sliced, lean as I like it and not tenderized so it still had some bite and texture. The noodles where lovely springy and sufficiently available so we struggled a bit finishing it all. Maybe it was because we already had a couple of drinks or maybe because we were super hungry but I thought that this was actually pretty darn good for a late night snack. I don’t come down to St. James very often but if I will in future I might just have Odeon’s noodles again.